Ragtime dealt with issues of today. 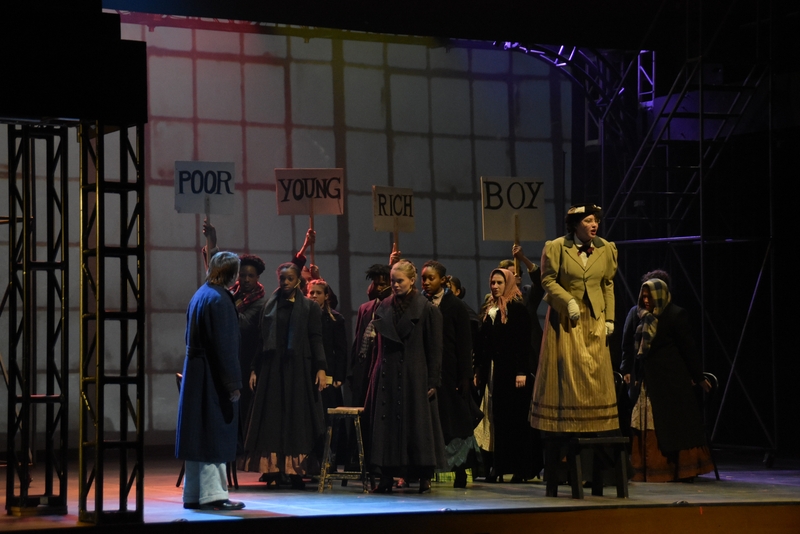 The institutionalization and systematic racism of African-Americans, an epidemic of wide-spread xenophobia, a metamorphosing country and depictions of power imbalances through economic standings, religion, race, and gender all coalesce in this year’s Frank Sinatra School of the Arts’ (FSSA), Musical Theatre production of Ragtime. Ragtime opens with a slow rhythmic beat and the actors are revealed when the lights creep up onto the stage. The actors are all assembled formally, with white, almost shining, outfits posing for the photographer who’s frozen in motion. This opening scene seems rather fitting for the frozen personalities that this representation of a specific group consistently display throughout the first-half of the play. They’re old-fashioned through and through. The character, Father, has rigid perceptions of gender roles in his family unit as well as his belief in the inferiority of African-Americans. Likewise, the character Mother reinforces gender roles that are contributed by her misguided view of how well-off she is in life and how she shouldn’t take it for granted. Naturally, these perceptions get passed down to their young son Edgar. 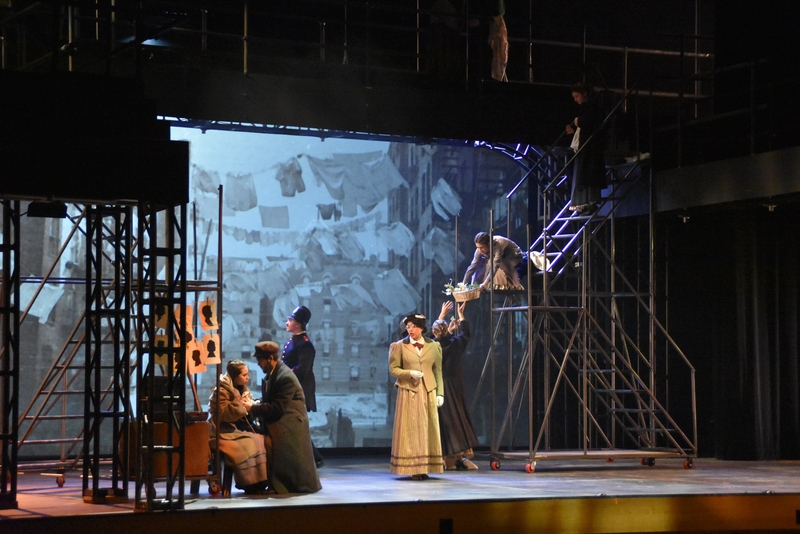 Ragtime’s balance of history and theme brought it to life. Of course all of the characters experience some type of epiphany that develops their character in a way that either cracks or completely destroys their archaic views on society. It is deeply moving to see Mother completely transform herself in the second act and watch Father take the tentative steps behind her toward that same path. Although this is all very touching, the musical doesn’t show the same kind of mercy to arguably the most oppressed group of American citizens in the entire ensemble; the African-Americans. Ragtime depicts Coalhouse Walker Jr.’s character development changing negatively instead of positively like Mother’s did. This juxtaposition carries a significant and insightful weight on the politics of today and how emotions as well as circumstances can shape the perception of African-Americans in the public-eye. The raw emotion of the actors and actresses and their singing ability really moved the audience. Coalhouse’s anger at the injustices he’s been dealt with when society sees his success is justified, his fury when Sarah was murdered during the presidential procession was justified as were the events that came as a result. This empathetic justification for Coalhouse offers a different insight to the many evidences that one sees in mainstream news outlets and the perceptions with which they try to paint African-Americans. Finally, the themes of xenophobia that permeate the songs that the Latvian immigrant Tateh sings alludes to the future xenophobic actions that the United States will commit toward foreign immigrants that will migrate to the country, as well as the harsh reality that there is no guarantee of success in America. The execution of these themes during the performance was incredible. 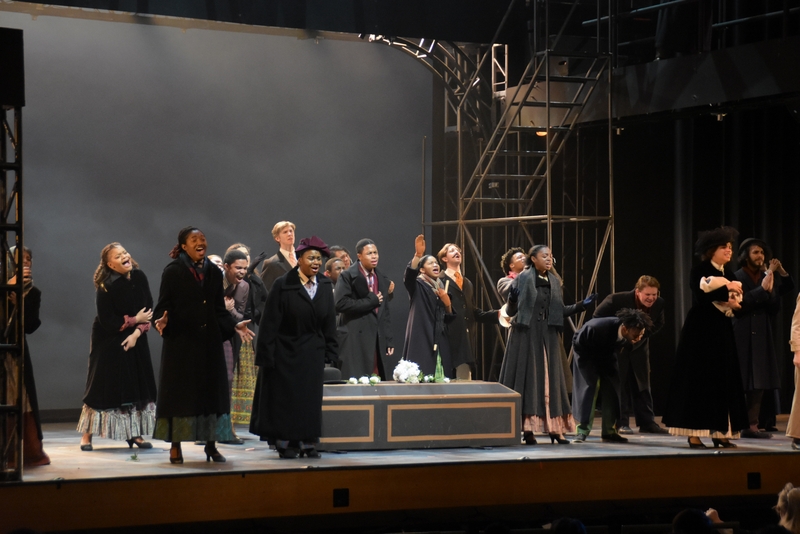 The raw emotion that all the actors and actresses brought onto stage was pivotal in letting the audience feel empathy and sympathy for the characters. In Ragtime, one is able to put aside their political differences and instead see the characters for who they are and feel for the situations they go through. Whether you’ve seen Michael Evans or Dominic Green perform as Coalhouse Walker Jr., you don’t see them as themselves. Once the lights dim and with the curtains pulled aside, they begin to speak and you see them as Coalhouse Walker Jr. They are Coalhouse in that moment. The authenticity and dedication in their roles is what makes Ragtime as memorable and relevant to today more than ever.